How do I manually add a receipt (i.e. no scanning) with the Enter Expense feature? FAQ / How do I add a receipt (i.e. no scanning) with the Enter Expense feature? 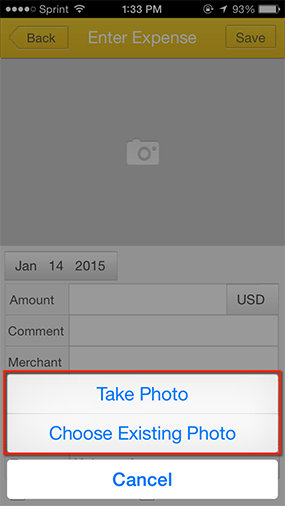 With Falcon Expenses there are two ways to add receipt images to your expenses list. One way is via the “Scan Receipt” feature, which is a premium feature that alleviates the user of having to enter the Merchant Name, Amount and Date, as we enter it for them. This is a premium service that Falcon Expenses charges for. For more information on how to use the “Scan Receipt” feature, please see the following FAQ: How do I scan a receipt? 1. Tap on the Enter Expense button from the capture screen. 2. Tap on the camera icon that is in the top half of the screen. 3. Choose whether you want to use and existing image or take a new photo. 5. 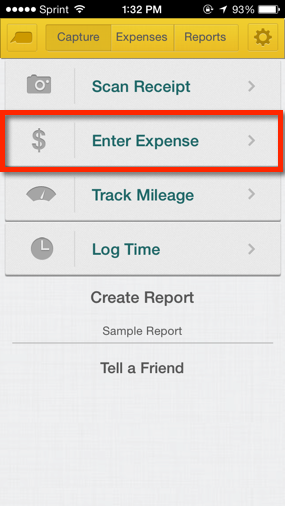 If you want, manually enter the rest of the expense data such as Merchant Name, Date and Amount.